This letter was written by Archibald Alexander Rudder (1833-1911), the son of Edward Vincent Rudder (1807-1890) and Mahala Nance (1814-1899) of Knox County, Tennessee. A. A. Rudder served in Co. C, 6th Tennessee Infantry with his brother, Robert Pascal Rudder (1829-1905). A. A. 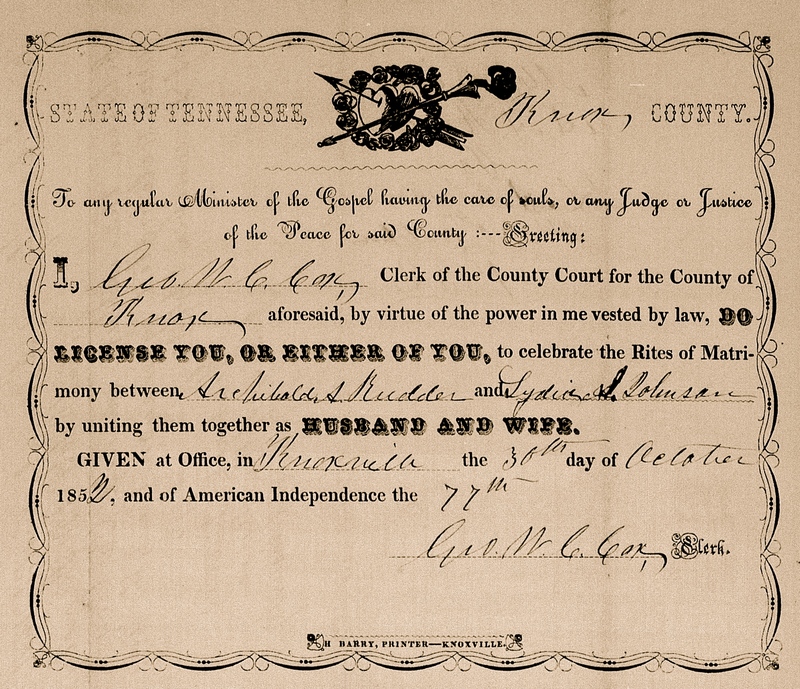 Rudder married Lydia Johnson (1831-1897) in Knoxville in 1852 and together they had four children ranging in ages from 3 to 11 by the time this letter was written in 1864. Moved to Cumberland Ford April, 1862. Cumberland Gap Campaign April to June. Big Creek Gap June 11, 12 and 15. Occupation of Cumberland Gap June 18-September 17. Wallace Cross Roads July 15. Big Creek Gap September 4. Expedition to Pine Mountain September 6-10. Pine Mountain September 7 (Co. “B”). Evacuation of Cumberland Gap and retreat to Greenupsburg, Ky., September 17-October 3. Goose Creek Salt Works September 19. Near Gallipolis, Ohio, and operations in the Kenawha Valley, W. Va., till November. Ordered to Louisville, Ky., thence to Cincinnati, Ohio, and Nashville, Tenn. Duty at Nashville till January, 1863. Guard trains from Nashville to Murfreesboro January 2-3. Action at Cox’s or Blood’s Hill January 3. Manchester Pike January 5. At Nashville till April, and at Carthage, Tenn., till August. Ordered to McMinnville August 31. March to Chattanooga September 12-20. Sequatchie Valley September 21-23. Action at Missionary Ridge and Shallow Ford Gap September 22. Near Summerville September 23. At Sale Creek till December. Ordered to Kingston, Tenn. Action at Kingston December 4. Duty near Knoxville and operations in East Tennessee till April, 1864. Atlanta (Ga.) Campaign May to September. Demonstrations on Dalton May 5-13. Rocky Faced Ridge May 8-11. Battle of Resaca May 14-15. Pursuit to Cassville May 18-19. Etowah River May 20. Operations on Pumpkin Vine Creek and battles about Dallas, New Hope Church and Allatoona Hills May 2-June 5. Kingston May 27. Allatoona May 26-29. Pine Mountain June 3-7. Operations about Marietta and against Kenesaw Mountain June 10-July 2. Lost Mountain June 15-17. Muddy Creek June 17. Noyes Creek June 19-20. Kolb’s Farm June 22. Assault on Kenesaw June 27. Nickajack Creek July 2-5. Vining Station July 4. Chattahoochie River July 6-17. Decatur July 19. Howard House July 20. Siege of Atlanta July 22-August 25. Utoy Creek August 5-7. Flank movement on Jonesboro August 25-30. Lovejoy Station September 2-6. Pursuit of Hood into Alabama October 3-26. Nashville Campaign November-December. Guard fords of Duck River till November 28. Spring Hill November 29. Battle of Franklin November 30. Battle of Nashville December 15-16. Pursuit of Hood to the Tennessee River December 17-28. At Clifton, Tenn., till January 15, 1865. Movement to Washington, D. C., thence to Fort Fisher, N. C., January 15-February 15. Fort Anderson February 18. Town Creek February 20. Capture of Wilmington February 22. Campaign of the Carolinas March 1 to April 26. Advance on Kinston and Goldsboro March 6-21. Relieved for muster out March 31, and ordered to Nashville, Tenn. Mustered out April 2 to May 17, 1865. The 6th Tennessee Infantry lost 1 officer and 43 enlisted men killed and mortally wounded and 157 enlisted men by disease (total 201) during the Civil War. Well Pa, I have the opportunity of dropping you a few lines to let you know how I am. I am doing as well as could be expected after such hard marching. We have been marching ever since we left there and have done some pretty hard fighting. There has been a heap of blood shed here but we gave the rebs such a bichin’ they have never got before. We have not suffered much loss in our regiment — not exceeding over 10 men killed in all we lost. The wounded are all getting well. Perry Johnson ¹ is about well now. He was shooked by a shell. The army is sweeping everything as they go. The people will make nothing here this year where the army goes. Wheat is in full bloom here and would be good if the army had let it alone. Corn here in places is knee high here. The rebs have been living pretty well here but they are gone up now. They are all going south with the rebs, leaving everything behind. We are still following them up. We are near a little town called Cassville ² on the railroad ³ near the High [Fire] Tower Road. [Brother] Robert is here with his train. He is well. He looks better than he did when he left home. We have the information here that the rebs have got a licking at every point. The war is coming to a close as fast as it can. I don’t think the army will pester you anymore in Tennessee. You need not be uneasy about us for we will take care of ourselves. We get plenty here to eat — hard tack, coffee, and sow belly. We got plenty of garden vegetables on this trip. Strawberries is plenty here in their big gardens. I got as many as I could eat the other day. When you write to us, you must direct your letters to the 23rd Army Corps. It is thought that we will come up that way now in a few days. We are fixing to go some way now but I don’t know which way we will go, but I don’t care so the time is going on. I send to all my best respects. So no more at this time but I remain your son till death and after death, I hope to meet you in heaven. I want you to help my family all you can till I get home again and I will satisfy you for it. So no more. Well Mother, I want you to raise a big gobbler for me when I get home. Tell Aunt Neely to hold herself in readiness to make me a good chicken pie. May God with his infinite mercies be with us now and forever in my prayer. ¹ There is a Perry Johnson in the 5th Tennessee Infantry. The 5th Tennessee was in the Battle of Resaca on May 14-15, 1864 with the 6th Tennessee and this may have been the engagement in which Perry was wounded. ² The town of Cassville was platted in 1833, as the seat of justice for Cass County. It was soon the center of trade and travel in the region recently comprising the Cherokee Nation. Both the county and town were named in the honor of General Lewis Cass, Michigan statesman and Secretary of War in the Cabinet of President Andrew Jackson. It was the county seat of Cass County from 1832–1861. The name was changed to Manassas in 1861 after the success of the Confederacy in the First Battle of Bull Run. But as a direct result, the town was burned by Sherman 1864 and never fully recovered. About 300 unknown Confederate soldiers died of wounds or disease in Cassville’s several Confederate hospitals. These hospitals operated from late 1861 until May 18, 1864, when ambulances moved patients south out of the path of the invading Federal forces. ³ The Western and Atlantic Railroad, connecting Atlanta with Chattanooga, passed within two miles of Cassville.